1st Light Battery: On Folly Island, South Carolina, with six 3.80-inch James Rifles. Captain Alfred P. Rockwell remained in command, with the battery still assigned to Tenth Corps, Department of the South. The battery had been in reserve, on Folly Island, through most of the Morris Island campaign. And remained there during the Second Major Bombardment of Fort Sumter. 2nd Light Battery: At Camp Barry, Washington, D.C., with six 3-inch Ordnance Rifles. Captain John W. Sterling commanded this much traveled battery. Having seen action at Gettysburg (as one of the reserve batteries pulled out of the Washington defenses in June) and then sent to New York to suppress riots, the battery returned to Camp Barry in October. In January 1864, the battery would move again. This time by boat to New Orleans and the Department of the Gulf. Battery B, 1st Heavy Artillery: At Brandy Station, Virginia, with four 4.5-inch siege rifles. Captain Albert F. Brooker commanded this battery assigned (as of the end of December) to the Second Volunteer Brigade, Artillery Reserve, Army of the Potomac. The battery was in reserve at Second Rappahannock Station. And thence went into winter quarters near Brandy Station. Battery M, 1st Heavy Artillery: At Brandy Station, Virginia, with four 4.5-inch siege rifles. Also in the Second Volunteer Brigade, Captain Franklin A. Pratt’s battery participated in the action at Kelly’s Ford (November 7) and the Mine Run Campaign. Expanding on the mention of the 1st Connecticut Heavy Artillery, the remainder of the regiment was in DeRussy’s Division, Defenses South of the Potomac, Twenty-second Corps. Colonel Henry L. Abbot commanded. Their assignment was to the Alexandria section of the line. Abbot corresponded frequently with Brigadier-General Henry Hunt in regard to artillery matters. Later, as the Overland Campaign began, the 1st Connecticut transitioned back into the army’s siege artillery and readied for use (as would be the case) around Richmond and Petersburg. I’ll summarize the 2nd Connecticut Heavy Artillery here so as to save a little space when we discuss the heavy artillery at the end of the quarter. The regiment originally organized as the 19th Connecticut Infantry during the summer and fall of 1862. The regiment, still as infantry, was assigned to the defenses of Washington in September of that year. Their assignment was on the south side of the Potomac. By the fall of 1863, the 2nd was brigaded with the 1st Connecticut (above). Given the nature of their duty, the regiment’s designation changed to “heavy artillery” on November 23, 1863 (though several documents suggest the 2nd Connecticut Heavy Artillery designation was used during the summer of 1863). Colonel Leverett W. Wessells commanded the regiment from its formation. But in September 1863 he resigned. Lieutenant-Colonel Elisha S. Kellogg, who’d been the acting commander for much of the year, was then promoted to the colonelcy, effective January 24, 1864. Kellogg, unfortunately, would not see the end of that year. But that story, and the 2nd Connecticut’s service as one of the “heavies” fighting as infantry in the Overland Campaign, is for a later discussion. 1st Battery: 80 Hotchkiss time fuse shell for 3.80-inch James. Battery B: 48 Hotchkiss time fuse shell for 4.5-inch rifles. Battery M: 121 Hotchkiss time fuse shell for 4.5-inch rifles. 1st Battery: 50 Hotchkiss percussion fuse shell, 360 case shot, and 190 canister for 3.80-inch rifles; AND 132 James pattern canister for 3.80-inch rifles. 2nd Battery: 360 Hotchkiss percussion fuse shell and 120 canister for 3-inch rifles. Battery B: 40 Hotchkiss case shot for 4.5-inch rifles. 1st Battery: 758 Schenkl shell for 3.80-inch rifles. Battery B: 394 Schenkl shell for 4.5-inch rifles. Battery M: 113 Schenkl shell for 4.5-inch rifles. 2nd Battery: 720 Schenkl case shot for 3-inch rifles. Battery M: 332 Schenkl case shot for 4.5-inch rifles. 1st Battery: Seventy-seven Colt navy revolvers, nineteen cavalry sabers, and forty-six horse artillery sabers. 2nd Battery: Sixteen Colt navy revolvers, twenty-five cavalry sabers, and twelve horse artillery sabers. Battery B: Four Colt army revolvers, four Colt navy revolvers, eight cavalry sabers, and eight horse artillery sabers. Battery M: Eight Colt army revolvers, eight cavalry sabers, eight horse artillery sabers, and one foot officers sword. 2nd Battery: 1,300 cartridge bags for 3-inch rifles. Battery B: 324(?) cartridge bags for 4.5-inch rifles. Battery M: 241 cartridge bags for 4.5-inch rifles. 1st Battery: 1,550 paper fuses, 1,150 friction primers, 25 yards of slow match, and 24 portfires. 2nd Battery: 1,800 friction primers. Battery B: 400 navy revolver cartridges, 400 paper fuses, 1,220 friction primers, 55 yards of slow match, 400 percussion caps, and 10 portfires. Battery M: 500 army revolver cartridges, 370 paper fuses, 440 friction primers, and 400 percussion caps. That sums up the four batteries reporting for Connecticut. Twenty rifles. And a healthy amount of ammunition. 1st Connecticut Light Artillery Battery: Reporting at Folly Island, South Carolina with six 3.80-inch James Rifles. Captain Alfred P. Rockwell remained in command, with the battery still assigned to Tenth Corps, Department of the South. The battery supported Colonel Thomas W. Higginson’s Edisto Expedition, aimed to divert Confederate attention from Morris Island. The 1st Connecticut lost two guns, on board tug Governor Milton when that vessel ran aground and was burned. The guns were recovered by Confederates. With the four remaining guns, Rockwell’s Battery went to Folly Island, where they replaced a set of Quaker Guns covering Lighthouse Inlet. The battery received replacements for the lost cannon. The battery history insists, “They were of the latest pattern and much praised by the comrades.” But the battery went on reporting six James rifles into the spring of 1864. In November, Rockwell took a brief leave and Lieutenant George Metcalf, to the dismay of the men, held temporary charge of the battery. 2nd Connecticut Light Artillery Battery: Reporting from New York City with two 12-pdr field howitzers and four 3.80-inch James Rifles. Still under Captain John W. Sterling and part of the 2nd Volunteer Brigade, Artillery Reserve, the battery was among the forces dispatched north in response to the New York Draft Riots. Sterling’s battery supported Brigadier-General Thomas Ruger’s brigade in August. In October, the battery returned to duty at Washington, D.C.
2nd Battery: 120 shell, 160 case, and 32 canister for 12-pdr field howitzers. 1st Battery: 190 shot, 50 percussion shell, 80 fuse shell, and 360 bullet shell for 3.80-inch rifles. 2nd Battery: 136 percussion shell and 240 bullet shell for 3.80-inch rifles. 2nd Battery: 24 canister for 3.80-inch rifles. 1st Battery: 132 canister for 3.80-inch rifles. 2nd Battery: 28 shell and 56 canister for 3.80-inch rifles. 1st Battery: 458(?) shell for 3.80-inch rifles. 2nd Battery: 156 shell for 3.80-inch rifles. Overall, a good quantity of rifled projectiles on hand. Even if for the less desired James rifles. 1st Battery: Seventy-nine Navy revolvers, thirteen cavalry sabers, and forty-six horse artillery sabers. 2nd Battery: Eighteen Navy revolvers and fifteen horse artillery sabers. Summaries posted later in the war were less particular about the distinction of “light” or “heavy” duties. So all four Connecticut batteries would appear together. But for the third quarter of 1863, we have to pretend there are two more lines on the form. The odd twist here was the two “heavy” batteries were serving with a field army. All the while, the two “light” batteries, for all practical purposes, were serving garrison roles! 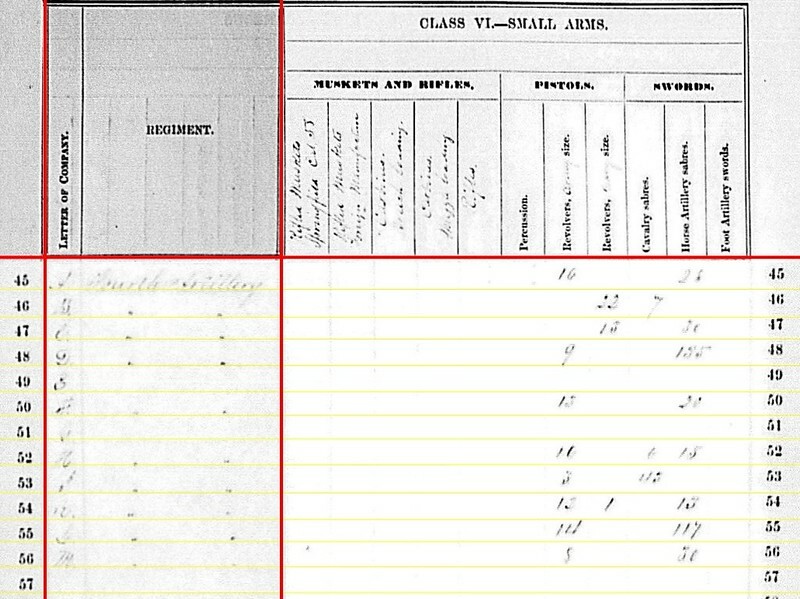 Looking at the summary for the 4th US Artillery for the 2nd quarter (ending in June) of 1863, we see ten of the twelve batteries posted returns (or more accurately, had their returns recorded by the Ordnance Department… assuming nothing here). Of those ten returns, all but one was received by the end of 1863. But only six offered a location for the battery as of the time of report. Is this the impact of active campaigning on the administrative reports? Let’s see…. Battery A – Reported at Sulphur Springs, Virginia with six 3-inch Ordnance Rifles. The location is obviously reflecting the date when the report was actually filed, not where the battery was located on June 30 of the year. The battery was, on that date, marching through Maryland. Lieutenant Alonzo Cushing had but three more days in command of this battery, supporting Second Corps. Battery B – No location given, but with six 12-pdr Napoleons. Of course we know this battery, led by Lieutenant James Stewart, was supporting First Corps and was camped south of Gettysburg on June 30. And of course, the following day the battery would perform admirably on the field. Battery C – And no location given, but also reporting six 12-pdr Napoleons. In late May the battery transferred to the 1st Brigade (Regular), Artillery Reserve, Army of the Potomac. Lieutenant Evan Thomas remained in command. That brigade was moving up from Frederick, Maryland on June 30. Battery D – Yet another without location given, though with six 3-inch Ordnance Rifles. This battery remained at Suffolk, Virginia, assigned to First Division, Seventh Corps and commanded by Captain Frederick M. Follett. Battery E – No report. Lieutenant Samuel S. Elder’s was in the First Brigade, Horse Artillery assigned to the Cavalry of the Army of the Potomac, with four 3-inch Ordnance Rifles assigned. Another battery with a location “on the march” and destined for the fields of Gettysburg. Battery F – Reporting at Kelly’s Ford, Virginia with six 12-pdr Napoleons. Yes, another reflecting the “as of report” location. Lieutenant Sylvanus T. Rugg commanded this battery in support of Twelfth Corps. We can place them, also, among the columns moving through Maryland and southern Pennsylvania on June 30. Battery G – No report given for this quarter. Battery G was assigned to the Eleventh Corps artillery earlier in June. The battery location as of June 30 was on the road between Emmitsburg and Gettysburg, with six 12-pdr Napoleons. Lieutenant Marcus Miller went on recruiting duty and was replaced, briefly, by Lieutenant Bayard Wilkeson. But Wilkeson would be mortally wounded on July 1 while leading his battery at a poor position on what became known as Barlow’s Knoll. Lieutenant Eugene A. Bancroft succeeded in command. Battery H – At Murfreesboro, Tennessee with four 12-pdr field howitzers. Lieutenant Harry C. Cushing in command of this battery, assigned to Second Division, Twenty-First Corps. Battery I – Belle Creek, Kentucky with four 12-pdr Napoleons. Lieutenant Frank G. Smith commanded this battery, supporting Third Division, Fourteenth Corps. the location is a question mark. The battery was, at this time, with its parent formation around Murfreesboro. Battery K – Bridgeport, Maryland with six 12-pdr Napoleons. Another location which reflects the later reporting date. This battery, under Lieutenant Francis W. Seeley, was supporting Third Corps and was around Emmitsburg on June 30. Seeley was wounded on July 2 (so badly that he later resigned his commission), and Lieutenant Robert James assumed command. Battery L – No location offered, but with two 12-pdr Napoleons and four 10-pdr Parrotts. Under command of Captain R. V. W. Howard, and assigned to First Division, Seventh Corps, in Southeast Virginia. . Battery M – At Murfreesboro, Tennessee reporting four 12-pdr Napoleons and two 24-pdr field howitzers. Lieutenant Francis L. D. Russell remained in command and the battery remained with Second Division, Twenty-First Corps. Of note, the battery upgraded from field howitzers to Napoleons. So comparing what we know about each particular battery’s service to what was recorded administratively, there does appear to have been some disruption of paperwork at the end of the second quarter. Though I don’t think anyone would fault the officers for inattention to cyclic reports at this interval of the war. They were more concerned with the real business of artillery. Battery B: 360 shot, 236 shell, and 164 canister for 12-pdr Napoleons. However, a tally of 452 case for 6-pdr field guns is offered. I think this is a transcription error and should correctly be interpreted as case for 12-pdr Napoleons. Battery C: 163 shot, 186 shell, 388 case, and 196 canister for 12-pdr Napoleons. Battery F: 288 shot, 96 shell, 388 case, and 96 canister for 12-pdr Napoleons. Battery H: 219 shell, 342 case, and 146 canister for 12-pdr field howitzers. Battery I: 192 shot, 62 shell, 192 case, and 64 canister for 12-pdr Napoleons. Battery K: 288 shot, 96 shell, 288 case, and 96 canister for 12-pdr Napoleons. Battery L: 96 shot, 32 shell, 96 case, and 33 canister for 12-pdr Napoleons. Battery M: 138 shot, 64 shell, 212 case, and 128 canister for 12-pdr Napoleons; 72 shell, 72 case, and 48 canister for 24-pdr field howitzers. With so many of these batteries seeing action at Gettysburg, we might seek some insight as to what was on hand for the battle and what was used. But yet again we must exercise some caution with making conjectures. There is an “as of date” along with a “reporting date” and other variables to consider here. More than a grain of salt is required, in my opinion. Battery A: 120 canister, 36 percussion shell, 319 fuse shell, and 673 bullet shell for 3-inch rifles. Battery D: 83 canister, 100 percussion shell, 542 fuse shell, and 475 bullet shell for 3-inch rifles. As there was no record for Battery E, we are left to wonder what Elder’s gunners had on hand. Battery L: 474 shell, 340(?) case, and 96 canister for 10-pdr Parrotts. Battery A: Sixteen Army revolvers and twenty-five horse artillery sabers. Battery B: Twenty-two Navy revolvers and seven cavalry sabers. Battery C: Eighteen (?) Navy revolvers and thirty horse artillery sabers. Battery D: Nine Army revolvers and 135 horse artillery sabers. Battery F: Thirteen Army revolvers and twenty horse artillery sabers. Battery H: Sixteen Army revolvers, six cavalry sabers, and fifteen horse artillery sabers. Battery I: Three Army revolvers and forty-five cavalry sabers. Battery K: Twelve Army revolves, one Navy revolver, and thirteen horse artillery sabers. Battery L: Fourteen Army revolvers and 117 horse artillery sabers. Battery M: Eight Army revolvers and thirty horse artillery sabers. With so many of these batteries seeing action in the opening days of July, the figures are, again, tempting. While trivial of sorts, the number of small arms reflect weapons of war used by the batteries. In some cases, we might seek precision as to the use of those weapons. For instance, when Lieutenant Alonzo Cushing drew his revolver to order his men back to their posts on July 3, was that an Army revolver, as was reported with his battery? Colt or Remington? Or something the Lieutenant had come by outside of official channels? The last important river barrier for the armies of Major-General William T. Sherman in their march to Alexandria, Virgina was the Rappahannock River. To gain crossing, the armies would cross through Spotsylvania and Stafford Counties, with one column traversing Orange and Culpeper Counties. That area of Virginia was the stage for so much of the war in the east, with numerous battles fought. For some members of Sherman’s command, this was a return to fields contested just a couple years earlier. For most, however, this was a chance for the “Westerners” to see where the “Easterners” had fought. I have the honor to report that this division broke camp at 7 a.m., moving in the center of the column, the First Division being in advance and the Fourth Division in the rear, and went into camp about five miles from Fredericksburg at 4:30 p.m., having made a distance of twenty-two miles. Yes, somewhat more distance than Sherman had preferred. But the march was made over terrain familiar to military movements and where roads were well prepared. While Hazen camped outside Fredericksburg that evening, Major-General Charles Woods’ First Division held a camp on the north bank of the Rappahannock River. I believe the camp location used by Woods’ men was in proximity to the “Slaughter Pen” of the December 1862 battlefield. But the records I have defy exact positioning. The following day, Major-General John Logan officially assumed command of the Right Wing. The Fifteenth and Seventeenth Corps crossed the Rappahannock using a pontoon bridge left by the Army of the Potomac at Franklin’s Crossing… yet another place name harkening back three years. But only wagon traffic delayed the progress of the men as the Army of the Tennessee bounded the Rappahannock with relative ease, compared to crossings by Federal forces earlier in the war. The Left Wing had a wider line of march. To avoid congesting the roads through the Wilderness, the Fourteenth Corps took a route through Orange County to Raccoon Ford and thence into Culpeper County. This route took the Fourteenth Corps, under Major-General Jefferson C. Davis, through one of the most heavily contested areas of the Civil War. But the soldiers were not sight-seeing. For them, a camp outside Stevensburg on May 15 was just one of over a hundred camps they made during the long war. But it was the last made during the war in Culpeper County… which had also seen hundreds of such camps. The following morning, the troops marched north to Kelly’s Ford to cross the Rappahannock. Again, lost on the soldiers on the march was the significance of that point on the map. Armies had fought over and crossed that ford repeatedly over the four previous years. The Fourteenth Corps was the last military command to splash through. Just another river crossing for the soldiers, but a significant mark in the passing of the war. The corps continued its march through places named Bristoe Station, Manassas Junction, Centreville, and Fairfax Court-house. All of which were simply waymarks of the march home for these men. May 14, the division having the advance marched, the same hour as yesterday, crossed the North Anna on pontoon bridge, and took a circuitous route toward Spotsylvania Court-House. The Mat, Ta, and Po, and several other smaller creeks were crossed during the day’s march; encamped south of Spotsylvania Court-House after a march of sixteen miles. Many officers and men embraced the opportunity to visit the famous battle-fields in this vicinity. 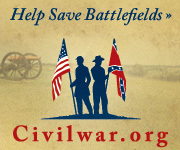 May 15, the division moved out at 5 a.m. toward Chancellorsville. The route was a portion of the section known as the Wilderness. At Chancellorsville the division was halted for three hours upon the battle-ground to enable the officers and men of the division to visit the scenes of that memorable contest in which most of the regiments took part. The division encamped for the night at United States Ford; marched fifteen miles. Sherman himself traveled over to visit the Twentieth Corps that day, with Major-General Henry Slocum providing some orientation. 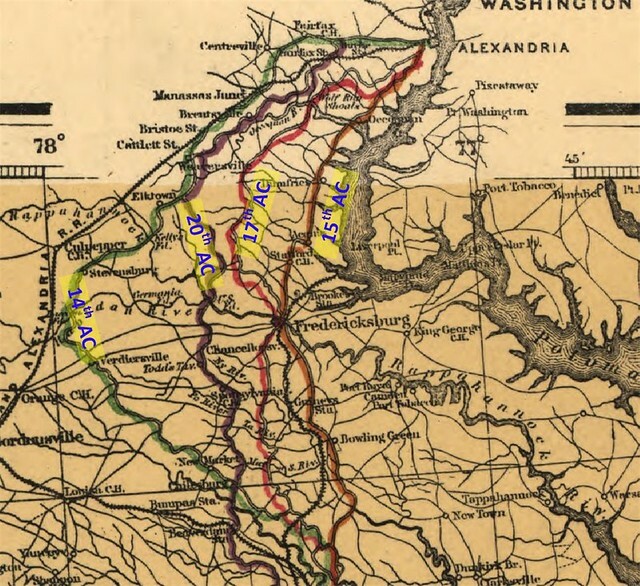 The next day, the Twentieth Corps crossed the Rappahannock at United States Ford… in different circumstances from the last time those men had crossed at that point. The remainder of the march toward Alexandria took the Twentieth Corps through places such as Hartwood Church, Brentsville, and Fairfax Station. In more ways than one, the Twentieth Corps was going home. On May 19 the Armies of the Tennessee and Georgia reached their designated camps outside Alexandria. There, near the banks of the Potomac, the Great March which had started in Atlanta came to its last pause. The last short march required of these soldiers was a Grand Review in the nation’s capital – a formal closure to the march… and the war. Yesterday’s post about the employment of Pratt’s 4.5-inch Rifles at Kelly’s Ford ran a little long. And there’s one more interesting angle to look at, given the records from the engagement. The participants provided a remarkably well detailed list of ammunition expended in the engagement. While not a major battle, the action at Kelly’s Ford on November 7, 1863 is a good case for reviewing what ammunition the battery commanders and section commanders selected for the tactical requirements. 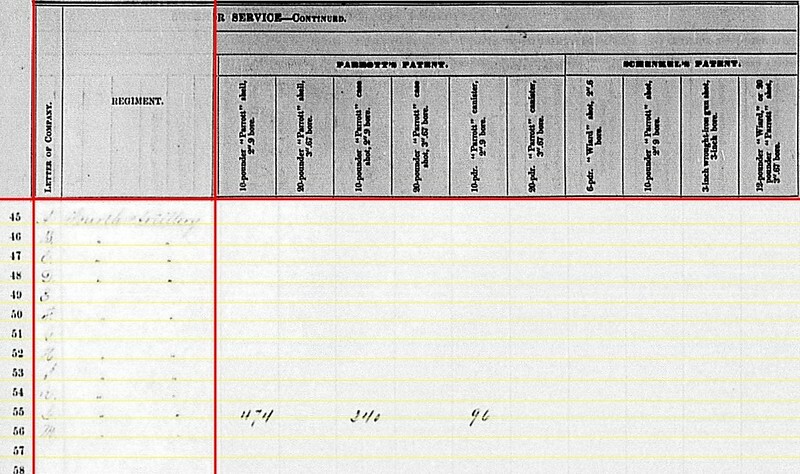 The total given by Randolph – 400 rounds – does not match that reported by Captain J. Henry Sleeper – 459 rounds. So either eight ammunition chests, with fifty rounds each, of 3-inch projectiles were used up. Or a little over nine were used. Of course the expenditure does not indicate any canister or bolts were fired. So there were more than just eight or nine chests opened up. And you are also thinking about Brigadier-General Henry Hunt’s concerns about mixing different rifled projectile types. Sleeper had his Schenkl and Hotchkiss shells all mixed in. Regardless, it was the case-shot Sleeper and his gun-chiefs selected most for their targets. In his report, Sleeper mentions firing on a brick mill building where Confederate sharpshooters were posted. He later replied to Confederate artillery attempting to drive his battery off. After the Confederate artillery retired, Sleeper fired on Confederate infantry that attempted to reform on the hills beyond Kelly’s Ford. Based on the wording of his report, and that of Randolph’s, the battery engaged those infantry targets for the longest period of the engagement. So it is logical to presume that is when most of the Schenkl case-shot were fired -targeting infantry inside a wood line. As mentioned yesterday, Captain Franklin Pratt’s Battery M, 1st Connecticut Artillery fired but 15 Schenkl shells with percussion fuses. These were fired at brick buildings where the Confederate infantry sheltered and later on the Confederate battery. Bucklyn’s guns went into battery about 300 yards from the ford itself. Their first targets were the skirmishers on the distant bank. When Captain John Massie’s Confederate guns opened upon Slepper’s battery, Bucklyn turned his Napoleons on that target. Likely most, if not all, of the solid shot fired were expended at those targets. Later, when supporting the Federal infantry crossing at the ford, Bucklyn fired a few rounds of canister. Again, let me pick at how, and how few of, the canister were used. Five rounds fired to cover the advance of the infantry. Bucklyn’s guns fired those so close that he later lamented the death of one of the friendly infantry, “but they were so nearly between me and the enemy, the accident could not have been avoided.” Or what we’d call today “Danger Close.” Keep in mind the maximum effective range of the canister rounds was between 300 and 400 yards. If Hunt’s earlier complaints were valid, then the canister was designed with engagements at that range in mind. So let’s dispense with the notion canister was only a defensive projectile. At Kelly’s Ford those canister rounds were useful in the offensive because of their “reach.” But of course, with the crossing effected so quickly (as compared to say a crossing at the same point on March 17, 1863), only five canister were needed. about a mile north of Brandy Station, a section of Edgell’s guns deployed and opened fire on a Confederate battery at the range of 2,000 yards. After a few rounds, the Confederate battery fell back. Edgell then moved up to the “left of and near Brandy Station.” There at a range of 1,800 yards, Edgell’s 3-inch rifles traded shots with two 20-pdr Parrotts and two smaller rifles. Edgell reported expending 56 rounds, while Randolph recorded an even 60. The preference, Edgell’s 3-inch rifles firing in counter-battery mode, was shell, with some case-shot mixed in for good measure. 3-inch rifle firing on troops in the woods – case shot. 12-pdr Napoleon firing counter-battery – solid shot, though the preference cannot be stated for a fact. 12-pdr Napoleon firing in direct support of infantry advance – canister, within range limitations. 4.5-inch Rifle – shell at anything. There’s a lot more I could suggest or speculate towards. But what I see with the artillery employment and ammunition expenditures is a lesson in how Civil War era armies effectively employed artillery in the offensive. The guns firing over the Rappahannock on November 7, 1863 (and those later firing around Brandy Station on November 8) succeeded in pushing the opposing forces back and then kept them back. That accomplished, the infantry was able to conduct their most important mission on the battlefield – occupy terrain. Camp near Falmouth, Va., June 7, 1863. Brigadier-General Ames left here yesterday and Brigadier-General Russell marches to-day, and it is expected that their brigades, consisting of 1,500 men and a horse battery, will be in position to-morrow night. The latter marches with rations for three days, and will require to be replenished before they cross the river from Bealeton. As they march without wagons, it will be advisable to have them sent to Kelly’s Ford, in season to be distributed to-morrow night. Two boats have also been forwarded, to facilitate the passage of the last-named ford. As it is held by the enemy’s pickets it may be advisable to throw over a small party above or below the ford, to knock them away, without resorting to the use of artillery, as the first gun would be heard by the enemy at Culpeper and vicinity. From the most reliable information at these headquarters, it is recommended that you cross the Rappahannock at Beverly and Kelly’s Fords, and march directly on Culpeper. For this you will divide your cavalry force as you think proper, to carry into execution the object in view, which is to disperse and destroy the rebel force assembled in the vicinity of Culpeper, and to destroy his trains and supplies of all description to the utmost of your ability. Shortly after crossing the two fords, the routes you will be likely to take intersect, and the major-general commanding suggests that you keep your infantry force together, as in that condition it will afford you a moving point d’appui to rally on at all times, which no cavalry force can be able to shake. It is believed that the enemy has no infantry. Should you find this to be the case, by keeping your troops well in hand, you will be able to make head in any direction. The general also recommends that you make use of the forest and the cavalry to mask the movements of the infantry from the enemy’s forces, and keep the enemy ignorant of their presence as long as possible, in order that at the proper time you may be able to cut off and destroy great numbers of them. The general further suggests that you throw out strong pickets in the direction of the Ely and Germanna Fords, and that you hold Stevensburg with not less than a regiment and a section of artillery, with special instructions to look after Raccoon Ford. All the fords on the Rappahannock below Kelly’s, and including it, are held by our forces. If you should succeed in routing the enemy, the general desires that you will follow him vigorously as far as it may be to our advantage to do so. The officer in command holding Kelly’s Ford will be instructed to lend you such aid as may be in his power, and it is hoped will be able to throw out on to the Culpeper road a sufficient force, in conjunction with your cavalry at. Stevensburg, to secure your flank from any force in that direction. Captain Dahlgren, aide-de-camp, will deliver this to you, and it is desired that he should remain until you recross the river, and that you communicate with headquarters as often as practicable. He will hand you some maps of the direction in which you are operating. Having received no reply from Washington as to the force to be sent to your assistance from General Heintzelman’s command, you will not be able to count upon any assistance from there. The forces put in motion by this order, just two days later, would engage in the largest cavalry battle of the war. And while not contesting the ranking as a cavalry battle, I must point out the Federal forces employed – a combined arms team. Yes, more cavalry than infantry or artillery. But all three arms would play a role, by design. The orders, while somewhat discretionary, pinned the Union cavalry chief to certain decisions. Particularly were to cross the Rappahannock. The mission of the force was the nearly same as that thrown across the river on March 17, 1863 – disperse and destroy the Confederate cavalry in Culpeper. Notice also the numerous fords mentioned. These were the swinging doors, particularly and frequently Kelly’s Ford, that both armies used in the back and forth of the Eastern Theater.